I have been a long time follower and admirer of Elizabeth Sarah Free (and her sister Caroline Free - such a talented duo!). The time and effort Elizabeth puts into creating her beautiful hand-stitched backgrounds is amazing and inspiring. Recently she shared a layout with a floral cross-stitched design and I immediately commissioned her to make me one too! I was (and am!) so excited to own an original Elizabeth Sarah stitched design! The next day I set to work turning Elizabeth's stitching into a layout. I found a recent photo of me with the kids and knew the embellishing would be minimal - the background does all the work! I hand cut a title from one of the patterned papers in my Oh My Heart collection with Pink Paislee and replaced the last word with a chipboard sticker. I tucked a flower above and below the photo and if you look carefully you'll see three puffy flower stickers placed in a visual triangle around the wreath. I love Elizabeth's mantra to my core, she says, "I'd rather spend a long time over one layout than rushing to complete several. I don't have the space to store loads of layouts!" 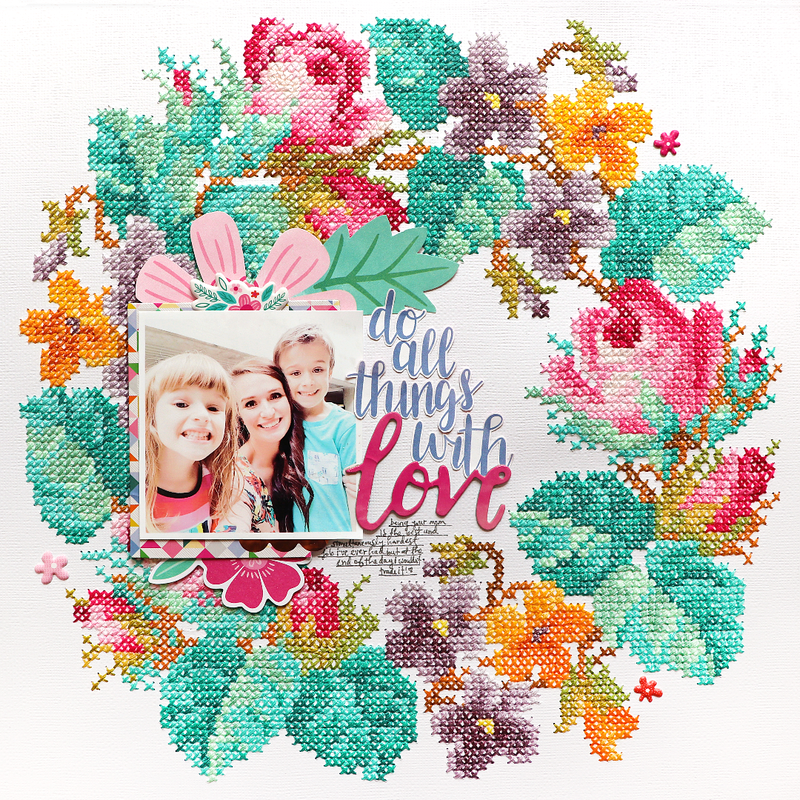 Some people scrapbook fast, others slow, but in the end, it's the memories that are preserved and how it makes us feel in the process that matters! Thank you to infinity and beyond to Elizabeth Sarah for sharing her talents! Поражаюсь вашим идеям и воображению.То , что Вы делаете , это так трудоемко. Супер. Wow wow wow!! That background she created!! Simply a masterpiece!!! I loveeeeeeeeeeee what you added to it!!! Just GORGEOUS!!!!!!!!!!!!!!!!!!!!!!!! WOW!!!!!!!!!!!!!!!!!!!!!!! It is a beautiful and hard job!Congrats! !